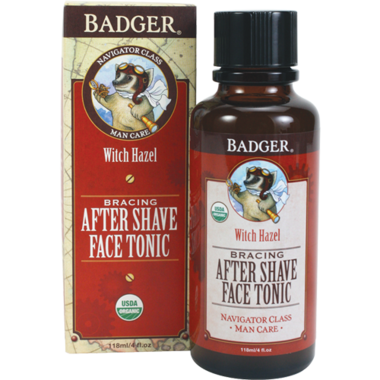 Badger Navigator Class Man Care After-Shave Face Tonic will cool, tone, and invigorate your face! This refreshing post shave tonic is a light Witch Hazel based bracer with a cooling hit of Menthol to invigorate, refresh, and tighten skin. Aloe hydrates and moisturizes while Bergamot uplifts your spirits. Great for all skin types. Directions for use: For best results, shake well and pour a generous amount into your palm. Apply freely across freshly shaved skin for a refreshing wake-up. For external use only. Ingredients: Water (Aqua), *Hamamelis Virginiana (Witch Hazel) Water, *Alcohol, *Glycerin, Agar/Xanthan Gum, *Aloe Barbadensis (Aloe) Leaf Juice, *Citrus Aurantium Bergamia (Bergamot) Peel Oil, *Rosmarinus Officinalis (Rosemary) Leaf Extract, *Menthol (Menthol Crystals), *Humulus Lupulus (Hops) Extract, *Cucumis Sativus (Cucumber) Seed Extract. It's nice for the skin but I didn't like the smell at all. Fortunately it goes away rapidly, but I prefer to use scented aftershaves. It's probably the witch hazel that smells odd here. But Thayers also uses witch hazel and doesn't smell funky. My husband has sensitive skin and bought this on a whim. He loves it and I will be ordering more.